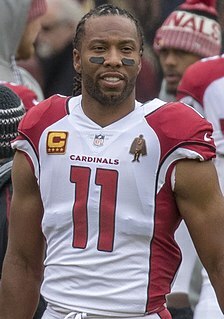 Larry Darnell Fitzgerald Jr. is an American football wide receiver for the Arizona Cardinals of the National Football League (NFL). He played college football at Pittsburgh, where he earned unanimous All-America honors. 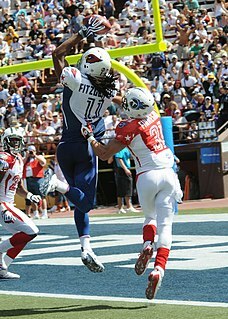 He was drafted by the Cardinals third overall in the 2004 NFL Draft. Sharod Lamor "Roddy" White is a former American football wide receiver who played his entire professional career with the Atlanta Falcons. He played college football at UAB, and was drafted by the Falcons in the first round of the 2005 NFL Draft. Charles Raymond White is a former professional American football player who was a running back in the National Football League (NFL) for nine seasons during the 1980s. Desmond Demond Bryant is an American football wide receiver who is currently a free agent. He played college football at Oklahoma State, where he earned All-American honors in 2008. He was drafted by the Dallas Cowboys in the first round of the 2010 NFL Draft and has earned three Pro Bowl berths and was a First-team All-Pro player in 2014. Golden Herman Tate III is an American football wide receiver for the New York Giants of the National Football League (NFL). He played college football at Notre Dame, where he was recognized as an All-American, and was drafted by the Seattle Seahawks in the second round of the 2010 NFL Draft. He has also played for the Philadelphia Eagles and Detroit Lions, with whom he made a Pro Bowl appearance. James Calvin White is an American football running back for the New England Patriots of the National Football League (NFL). He played college football at Wisconsin and was drafted by the Patriots in the fourth round of the 2014 NFL Draft. In Super Bowl LI, he scored three touchdowns, including the game-winning score in overtime. He set Super Bowl records for receptions with 14 and points scored with 20, including the first points ever scored in overtime in a Super Bowl. Timothy Antonio "T. J." Yeldon Jr. is an American football running back who is currently a free agent. He was drafted by the Jaguars in the second round of the 2015 NFL draft. He played college football at Alabama. Amari Cooper is an American football wide receiver for the Dallas Cowboys of the National Football League (NFL). He played college football at the University of Alabama where he was the Biletnikoff Award winner as the nation's top receiver and a unanimous All-American in 2014. Widely considered the top wide receiver prospect of the 2015 NFL Draft, he was selected with the fourth overall pick by the Oakland Raiders. Latavius Murray is an American football running back for the New Orleans Saints of the National Football League (NFL). He played college football at UCF and was drafted by the Oakland Raiders in the sixth round of the 2013 NFL Draft. Murray has also played for the Minnesota Vikings. Brandin Tawan Cooks is an American football wide receiver for the Los Angeles Rams of the National Football League (NFL). He was drafted by the New Orleans Saints in the first round of the 2014 NFL Draft. He played college football at Oregon State, where he received All-American recognition in 2013. Devonta Freeman is an American football running back for the Atlanta Falcons of the National Football League (NFL). He was drafted by the Falcons in the fourth round of the 2014 NFL Draft. He played college football at Florida State. Nelson Efamehule Agholor is a Nigerian-born American football wide receiver for the Philadelphia Eagles of the National Football League (NFL). He played college football at USC. He was the 20th overall pick in the 2015 NFL Draft. With the Eagles, he won Super Bowl LII over the New England Patriots. Tyler Anthony Montgomery II is an American football running back for the New York Jets of the National Football League (NFL). He played college football at Stanford. Montgomery was drafted as a wide receiver by the Green Bay Packers in the third round of the 2015 NFL Draft. In 2016, he switched over to running back. Martavis Bryant is an American football wide receiver who is currently a free agent. He played college football at Clemson, and was drafted by the Pittsburgh Steelers in the fourth round of the 2014 NFL Draft. Ezekiel Elijah Elliott is an American football running back for the Dallas Cowboys of the National Football League (NFL). He played college football at Ohio State, where he earned second-team All-America honors in 2015. He was drafted by the Cowboys fourth overall in the 2016 NFL Draft. In his first NFL season, he led the league in rushing yards and was invited to the Pro Bowl. Christian Jackson McCaffrey is an American football running back and return specialist for the Carolina Panthers of the National Football League (NFL). He played college football at Stanford, and was drafted by the Panthers with the eighth overall pick in the 2017 NFL Draft. As a sophomore in 2015, McCaffrey was the AP College Football Player of the Year and the runner-up for the Heisman Trophy. He holds the NCAA record for most all-purpose yards in a season with 3,864. In the NFL he is the current record holder for most receptions by a running back with 107; as well as the Carolina Panthers single-season receptions leader. Derek John Watt is an American football fullback for the Los Angeles Chargers of the National Football League (NFL). He played college football at Wisconsin, and was drafted by the Chargers in the sixth round of the 2016 NFL Draft. His older brother is J. J. Watt of the Houston Texans and his younger brother is T. J. Watt of the Pittsburgh Steelers. Ronald Jones II is an American football running back for the Tampa Bay Buccaneers of the National Football League (NFL). He played college football at USC. Christopher Dewayne Carson is an American football running back for the Seattle Seahawks of the National Football League (NFL). He played college football at Oklahoma State. He was born in Biloxi, Mississippi and grew up in Lilburn, Georgia, where he attended Parkview High School. Prior to attending Oklahoma State, he studied and played football at Butler Community College in Kansas. This biographical article relating to an American football tight end born in the 1950s is a stub. You can help Wikipedia by expanding it.